Our 12 inch diameter vanity clocks are a stylish piece with exceptional functionality. Consisting of a lithograph mounted on .4 inch thick wood, it comes with metal hands and a plastic quartz movement mechanism. Requires 1 AA battery. Check out all of our styles! Please note, our products are proudly made in the United States. Any products shipped from outside of the United States from a third party seller is likely a counterfeit product, and may result in an undesirable buying experience. For example, lower quality goods and longer ship times. 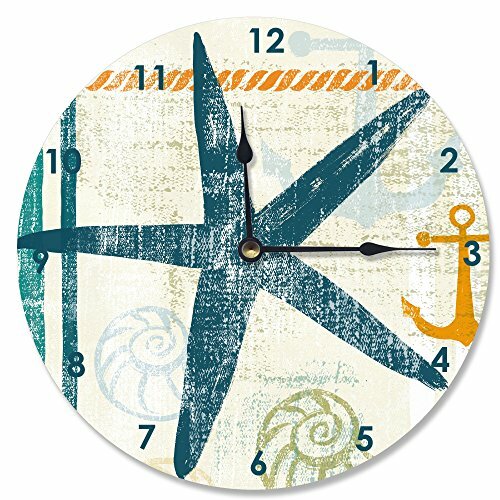 Our decorative wall clocks make functional fun. If you have any questions about this product by Stupell Industries, contact us by completing and submitting the form below. If you are looking for a specif part number, please include it with your message.